Mizuno Wave Mujin 5 are neutral trail running shoes. Few changes featured in Mizuno Wave Mujin 5 must be accepted as confirmation of good work from the japanese brand in former editions and also support from all runners who pay retail price to get them. 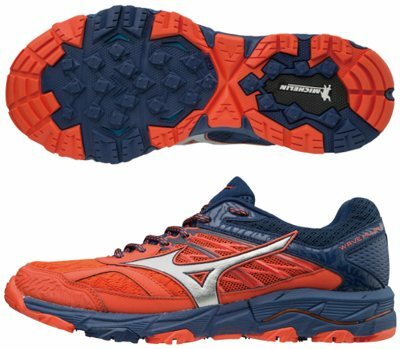 The Wave Mujin 5 is located one step (more cushioned, heavier, more details, more expensive..,) above good Wave Daichi 3 within trail running lineup from Mizuno, a shoe intended for long distances (ultra running) mainly on dirt paths because it does not outperform on technical terrains. As usual, there is a Gore-Tex® (GTX) edition available for challenging weather conditions. As well as its predecessor Wave Mujin 4, most interesting change takes place with minor but significant updates in upper which is not yet at the same top level than rest of the shoe. Basically all attention goes to new heel counter to increase stability and reengineered toe cap to protect from robust objects along the way. Internal straps (Dynamotion Fit™) to keep everything in place and sewed overlays for secure fit remain the same. As mentioned above, there is no change in both midsole and outsole in current Wave Mujin 5. Impressive midsole keeps basic construction with specific rock plate (ESS) in the forefoot (similar as in more agile Wave Hayate 3) to prevent stone bruising. Midsole keeps innovative U4icX™ layer on top for softer sock absorption and great comfort targeting heel strikers. Rest of midsole is made of full length AP+ and concave Wave™ plate in the rear side featuring reliable and abundant cushioning. No changes as well in outsole built in collaboration with renowned tyre manufacturer Michelin™, taking advantage of its experience in off-road tyres (no Xtuds anymore) with specific rubber depending on the area for great traction and durability. Xta Groove in midfoot provides extra flexibility for uneven ground adaptation.